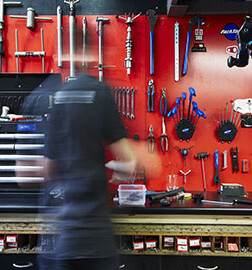 Gungahlin is open 7 days a week for all your cycling needs. 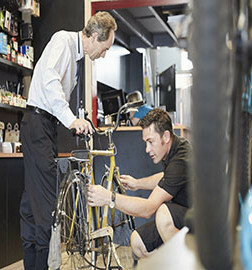 Belconnen is open 7 days a week for all your cycling needs. Albury Wodonga’s newest bike store. Our workshop team are obsessed with bikes. That’s why we employ them. They can change tyres with their eyes closed, sense a worn thingamajig and a broken doovalacky and when it comes time for them to sleep, they count spokes instead of sheep. They love a challenge too. Present them with a creak that no one else has managed to fix and see what happens. 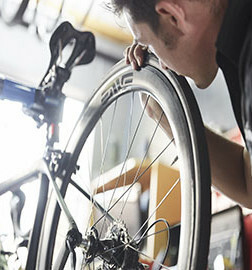 Some say mechanics, we say bike whisperers. With talent like that, we are often booked out a week in advance so bookings are essential. 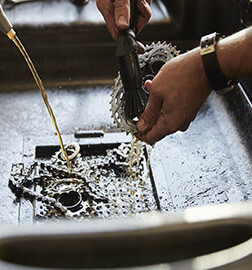 We offer same day servicing on most repairs which means you can drop off your bike first thing and be back out pedalling by late afternoon. Minor adjustments and flats can usually be done on the spot without booking ahead. If in doubt, give us a call. REGULAR $99 + parts/Recommended every 4-6 months/Wipe down frame and check for damage/True wheels/Adjust gears/Adjust limit screws/True derailleur hanger/Adjust brake pads and cable tension/Check and adjust headset/Check and tighten all nuts and bolts including pedals and cranks/Check tyre wear and pressure. COMPREHENSIVE from $150 + parts/Recommended every 6-12 months/Regular Service plus: Degrease drive train/Wash and clean bike/Adjust and lock down hub cones/True and tension wheels/Clean and lube cabling. COMPLETE OVERHAUL ROAD $300 + parts/Recommended every 2000kms or 12-18 months/Completely strip bike back to frame/Clean and tap threads in bottom bracket/Remove entire drive train and thoroughly degrease/Remove, regrease and reinstall bottom bracket/Grease headset bearings and readjust/ All cables and housing replaced (included)*/Grease hub bearings and readjust/*Excludes Campagnolo cables and housing – please contact us for pricing. COMPLETE OVERHAUL MOUNTAIN $550 - Recommended every 2000kms or 12-18 months/Completely strip bike back to frame/Remove drive train and degrease/Remove, regrease & reinstall bottom bracket/Grease headset bearings and readjust/Grease hub bearings and readjust/Replace all cables and housing (included)/Bleed front and rear disc brakes/Service front and rear suspension (seals and oils included)/Check and regrease all pivots/Thoroughly inspect frame and fork for damage. Fox and Rock Shox serviced by our specialist technician in-house. 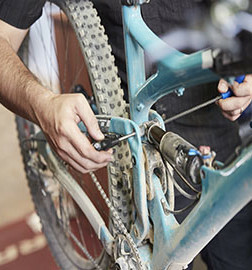 Fork servicing starts from $95 + parts. 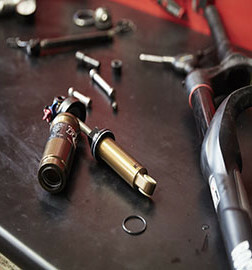 Air can services on Fox and Rock Shox rear shocks from $45 + parts. Please note these prices do not include parts: Wheel build $85/Wheel true $25/Hub overhaul $30/Gear tune $25/Tube change $25 including tube/Safety check from $50/Insurance assessment and report $50/Bike fits from $145/Custom bike builds - contact us for pricing/Di2 diagnostics - contact us for pricing. Born in a barn. Raised on rocket science. Raced to win. Warrantied for life. Loved the world over. This is Trek. We believe in bikes. 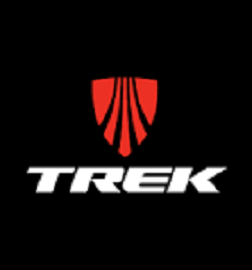 At Bike Culture, we believe in Trek which is why we have been a proud Trek dealer since 1999. Yeti Cycles. Ride Driven. Founded in 1985, Yeti have been there since the beginning of mountain biking. Ride one and you’ll want to become part of the turquoise tribe. Bike Culture is proud to be the sole Yeti dealer in the ACT. Bicycle components, accessories and apparel, all firmly grounded in no-nonsense design philosophy, valuing performance and usability, not fads and gimmicks. Cool. Fun. Hip. Bikes that make you smile.